Since the early 90’s, Brisbane’s Dockside Comedy Bar has been the City’s number one place for laughs, but now there is a new contender on the scene. 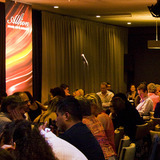 The Albion Comedy Club opened in mid 2008 and has steadily gained a reputation as a first class venue and night out. Whilst the Dockside club has always had a very intimate feel due to it’s compact size, the Albion Comedy Club is more spacious, holding around 350 people. This allows for a more relaxed atmosphere. As with most comedy shows, those sitting in the front rows are easy pickings for the comedians. Luckily, the spacious layout allows the more timid members of the audience to watch from a safe distance. The club is open Friday and Saturday nights. Doors open at 7pm with the night split into three sections. An MC starts proceedings around 8pm before introducing the first couple of acts followed by a short break allowing the audience to grab a drink or stretch their legs. The show then starts up again with another couple of comedians before the night is capped off by a headline act. Be warned! The humour can be very adult oriented with course language so it may not suit everyone. As well as the comedy, the club relies on its top grade menu to lure in its audience. The steaks take top billing but there are a number of other options for you to choose from. Mains are around $25-$30 and are value for money. You can order food up until 9.30 with the bar staying open until the end of the night. Tickets usually cost $25 but are cheaper for bookings of 10 people or more. The club also offers packages with admission, entrée and main all included in the price. Check the website for further information. Whilst bookings are not essential, the club does fill up most nights so it is best to call ahead. In November and December the club is especially busy so book early.